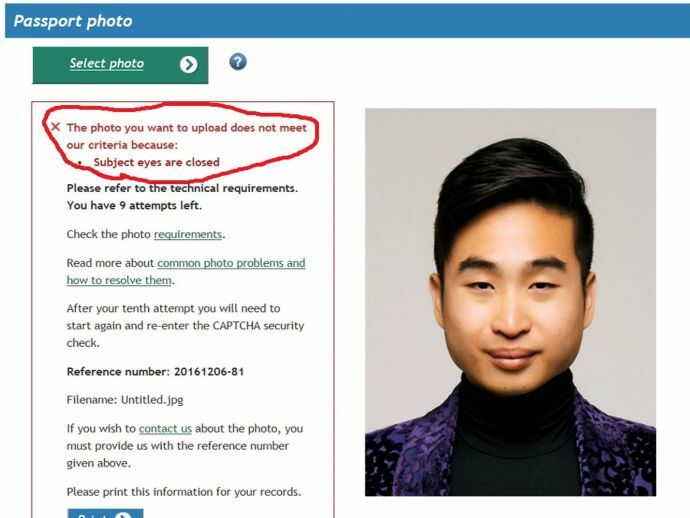 In one of the most hilarious incidents, a New-Zealand man of Asian descent had his photograph rejected because the system thought his eyes were closed while taking the photograph. The 22 year old young man wanted to take his photograph for his passport application. Apparently his eyes were so small that the automated system thought they were closed and in turn, his photo got rejected. Richard Lee, the unfortunate victim of this tech mix-up hilariously laughed it off and was quoted saying, "No hard feelings on my part, I've always had very small eyes and facial recognition technology is relatively new and unsophisticated,"
"It was a robot, no hard feelings. I got my passport renewed in the end." According to statistics, around 20 percent of photos are rejected due to different technical reasons. Lee eventually took the photo for a second time in proper lighting and clicked a perfect photo to get his application accepted.